Bubby loves trucks. And because GiGi, his paternal great-grandmother who babysits him each Friday, takes Bubby outside or to the window to watch the garbage men collect his trash each week, Bubby especially loves garbage trucks. So when I approached HearthSong -- a company I've loved and patronized since Bubby's mom was Bubby's age -- to ask if I could review some of their products and they offered up the Riding Dump Truck, I jumped all over that. Bubby posing with the Riding Dump Truck. Checking out the capacity of the mini dumpster. The mini dumpster is the perfect size for Matchbox cars. Doing a Vanna White display of the rear cargo hold -- the spot Bubby puts Mom's large (size 10!) shoes for hauling around the home. Hopping on for a ride. Mastering the parallel parking skills ... and keeping it safe between rounds of riding.He loves it! He has a little trouble using his feet to push himself along because the width of the truck is a bit wider than Bubby's stance, but the truck is made for kids 3 and up and my Bubby is only coming up on the 2-year mark. So I'm sure his riding skills will improve. In the meantime, a little push from Mom or Dad is all he needs. 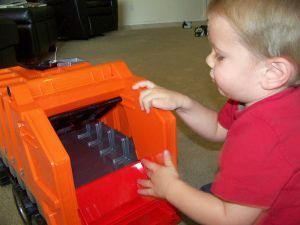 One thing that was a bit confusing -- for Bubby, his mom and me when I checked out the truck before shipping -- was figuring out how to make the lift work for the large dumpster on the back of the truck and the smaller one on the side. We couldn't figure out how to make the buckets lift and dump as you'd think they were meant to do. And there were no instructions included, on or in the box. Although, as Megan pointed out, the product is German made, so unless one of us could read German, it would have made no sense anyway. Overall, Bubby loved the truck. He can't ride it well by himself yet, but that'll come as he gets closer to the age 3 recommendation on the box (age 4 on the website). In the meantime, he uses it to haul all his Matchbox trucks and cars and helicopters ... and his mom's shoes, too. I was especially pleased with the fact that the truck was made of a heavy-duty plastic. It's tough and sturdy for all the play to come -- especially considering that it holds up to 100 pounds and it's gonna take Bubby a long time to reach that weight! -- but it was light, so shipping costs weren't exorbitant. Of course, grandmas looking to purchase one for a grandchild could always choose to have it shipped directly from HearthSong to the lucky recipient. 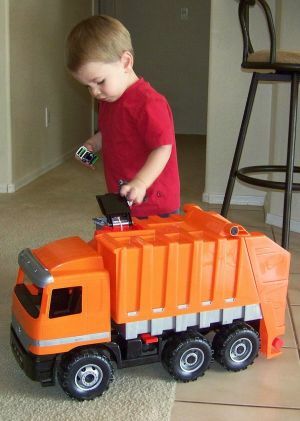 Visit HearthSong -- where their tagline is "Toys You'll Feel Good About Giving" -- for more information on the Riding Dump Truck ($59.98) and other nifty, creative toys.